For hospitals, medication reconciliation is critical to quality patient care, but it’s often a time-consuming process. At Hugh Chatham Memorial Hospital, collecting medication history frequently required an hour of a pharmacy technician’s time in talking to the patient, reviewing a baggie full of pill bottles, and calling local pharmacies. 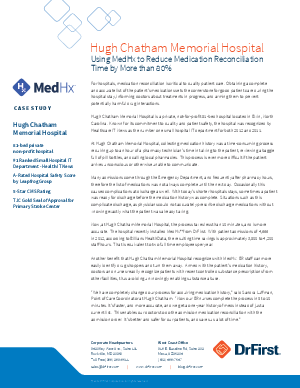 Learn how Hugh Chatham decreased their medication reconciliation time by 5-10 minutes per patient, resulting in a time savings of 4,200 staff hours.